Rates for the Little Luck are the most affordable in Colorado! The facility is priced at $125 per night, weekends and holidays, $100 per night for weekdays. There are additional discounts for long term stays. A week is $500 and a month is $1500. A minimum 2-night stay is required. Riding groups are encouraged to reserve a week or a month and share the time between members as is practical for individual needs. One person can make the arrangements for the whole group and the scheduling from there is up to you. Please have all applicable animal vaccinations, wormings and Coggins certificates up to date. · Reservations can be made by phone or e-mail and must be made at least a week in advance. · Reservations made more than a month in advance require half of the payment made by check. · Reservations made less than a month in advance, or made for holiday weekends must be paid in full. · Reservations may be canceled up to 2 weeks prior to the reserved date and will be subject to a $45.00 processing fee. 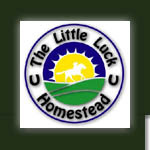 The Little Luck Homestead is open from mid May to mid October.